Stop what you’re doing -- pick up the phone and call your sister while she’s on her way to work. Go downstairs and hug your brother as he eats his morning cereal. Today, April 10, marks the national holiday to celebrate your sibling. At no surprise, Seahawks LB Shaquem Griffin and CB Shaquill Griffin both took to Twitter to express their gratitude for one another. Shaquem was born only a minute after his brother Shaquill. The twins aren’t only just biological brothers, but they’re teammates, best friends, and roommates. The dynamic duo has played on the same team since their early days of peewee football in St. Petersburg, Florida. Their partnership continued into their college football career at the University of Central Florida and has yet to come to a halt. Shaquem joined his brother on the Seahawks roster after being selected by the team in the fifth round of the 2018 NFL Draft, at No. 141 overall. Shaquill will be going into his third year with the team after being drafted the year before his brother at No. 90 overall. The Griffins weren’t the only ones highlighting the holiday on social media, the official Twitter account of the National Football League also posted a tweet showcasing some of the league’s prestigious pairs, including the Griffins. In addition to the NFL, our official twitter account and that of CenturyLink Field also posted tweets to celebrate the holiday. Today’s ‘Social Post of the Day’ comes from sports performance facility Ford Sports, as they showcase a workout video featuring the Griffin brothers. We officially announced our 2019 preseason schedule which includes matchups with Denver, Minnesota, Los Angeles (Chargers), and Oakland. Brady Henderson from ESPN.com analyzes the Seahawks’ 2019 draft situation. Gregg Bell at The Tacoma News Tribune compares our 2019 preseason schedule to past preseason schedules. The staff at 710 ESPN Seattle reviews the Seahawks’ offensive line in the 2018 season. 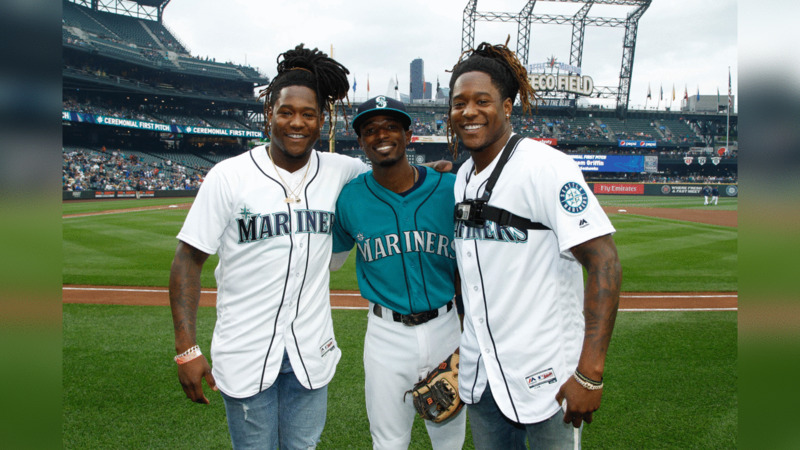 Seahawks rookie linebacker Shaquem Griffin and Seahawks second-year cornerback Shaquill Griffin were special guests at the Seattle Mariners game on Friday night at Safeco Field, where Shaquem tossed out the ceremonial first pitch to his twin brother Shaquill.